A worldwide call for women and girls to bring light to their climate struggles and solutions. Join the Women’s Earth and Climate Action Network, The Women’s Global Call for Climate Justice and allies around the world for ‘Women Act for Climate Justice — Ten Days of Global Mobilization’ from 28 October until 6 November, 2016. Diverse women and girls around the world are organizing together to show their resistance to environmental and social degradation; to highlight the climate impacts our communities are facing; to demand drastic change away from our unjust neoliberal economic and development systems; and to demonstrate the many effective, just and safe climate solutions, strategies and political calls that are being implemented by women and girls around the world on a daily basis. 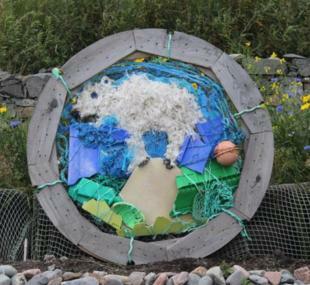 For example, in the Shetland Islands a group of women – Da Wives Atween Wadders – gathered sea-borne rubbish from a local beach and used it to create a collage of Uruk, the polar bear, standing on a melting iceberg. ‘Women Act for Climate Justice: Ten Days of Global Mobilization‘ is a worldwide call for women and girls to bring light to their climate struggles and solutions by sending in photos and statements; or through escalated actions including – but not limited to – educational events, community projects, protests and marches. The 2016 ‘Women Act for Climate Justice’ campaign has been called in advance of the November 2016 United Nations Framework Convention on Climate Change (UNFCCC) – COP22 Conference in Marrakech, Morocco, where we must work together to ensure a sustained civil society presence and pressure to demand that all government’s road maps ahead originate in a climate justice framework, and with respect to human, Indigenous and women’s rights, and gender, social, economic and ecological justice. ‘Women Act for Climate Justice — Ten Days of Global Mobilization’ is an opportunity for diverse women and girls around the world to organize together and show their resistance to environmental and social degradation. Although COP21 in Paris last year was perhaps the most important international climate negotiation of our time, COP22 will, in many ways, be equally important. COP22 is where intentions by governments must become more ambitious and result in detailed plans. The hope is the campaign will provide a powerful tool for highlighting many of the just and safe climate strategies/solutions of women and girls from around the world, and putting forward legal and policy demands as governments meet to act upon last year’s Paris Agreement. That said, the Women Act for Climate Justice’s decentralized mobilization is intended to show there are collective actions and voices far beyond the UNFCCC calling for continued momentum in the years to come. Women of all ages and allies around the world are invited to share their photo and statement and/or hold a variety of decentralized local actions over the extended action from October 28 to 6 November. Take a photo of yourself and/or a group holding up sign[s] with messages about the climate impacts your community is facing, your solutions, and/or your message to world governments in advance of COP22, and send it in. We encourage participants to take their action photo at a meaningful location, such as a site of pollution, extraction and profit, or a place of continued struggle, resistance and hope. Example messages include: ‘Keep Fossil Fuels in the Ground’, ‘Keep the oil in the soil’, ‘No Gender Justice without Climate and Ecological Justice’, ‘No Climate Justice, Without Gender Justice”, “Water is Life’, ‘No Healthy Oceans, no Life’; ‘Climate Justice Now’, ‘Women for 100% Renewable Energy’, ‘#WomenClimateJustice is our name, Resistance is our aim’, ‘Communities own seeds, not corporations’, ‘System Change, Not Climate Change’. A second level of action would be to involve organizing town-hall or village meetings, vigils and demonstrations, rallies, sit-ins, marches, educational events, art projects, and other actions and statements to showcase local struggles and solutions being offered by women leaders and their communities. Organize a sit-in, a march, a demonstration, a protest or other non-violent direct action at sites of extraction, places of corporate destruction, pollution and profit, and/or sites of positive resistance and solutions. Please do submit photos, videos, and statements to the ‘Women Act for Climate Justice — Ten Days of Global Mobilization’ web portal which will be open from October 28 until 6 November. No action is too small and EVERY voice is critical! Your diverse ideas are welcome. In the days preceding COP22, global action submissions will be woven together and shared via social media, shared images and videos, and print and digital news outlets. Submissions also will be shared at events in Marrakech during COP22. For further information, how to join in, what to do next, click here.